I've been meaning to try Scotchtails in Borough Market for ages, but always get distracted by Ethiopian Flavours. 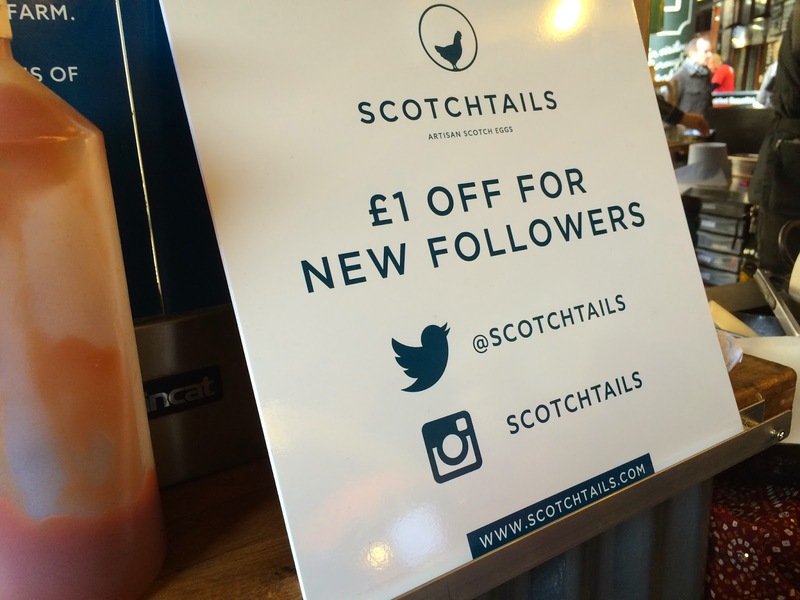 Finally, on a warmer day when cravings for something super hearty was diminished, Scotchtails was the lunch time pick. The menu was straightforward, and the meal deal it was. New followers on social media get £1 off, so that's exactly what I and my lunch buddy did. Score! 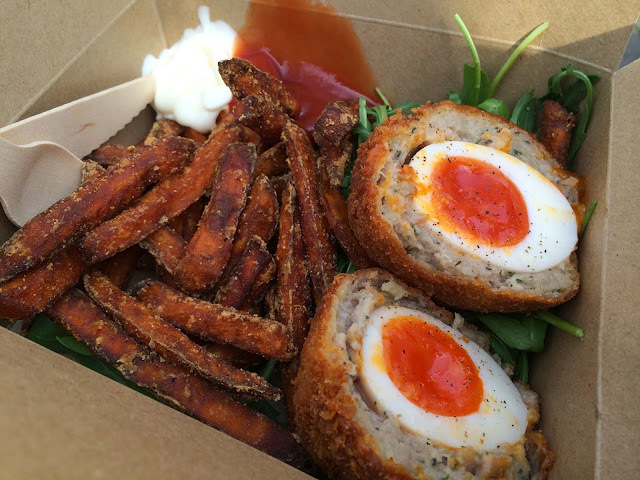 This was what the Scotch eggs and sweet potato fries looked like on display. Our meal deals came with slightly overcooked sweet potato fries, but were nevertheless still pretty good. 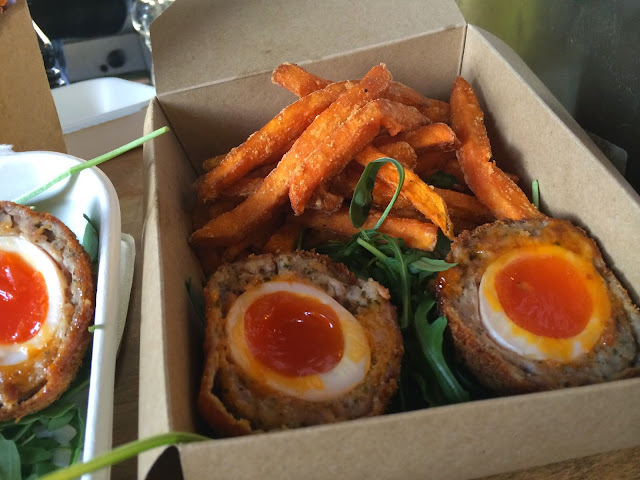 And onto the main star of the show is of course the Scotch eggs itself! What does it take to make a good scotch egg? A soft boiled egg with a runny centre, juicy and flavourful sausage meat and a crispy breadcrumb coating. Scotchtails ticked most of the boxes here. The scotch egg seemed a little over-fried resulting in a crunchy exterior rather than a crispy one, and whilst the sausage meat was juicy and moist, the flavour was a tad too strong on herbs and not enough 'sausage-y' flavour. Good quality eggs are used and can be told by the deep orange yolk instead of a pale yellow one. 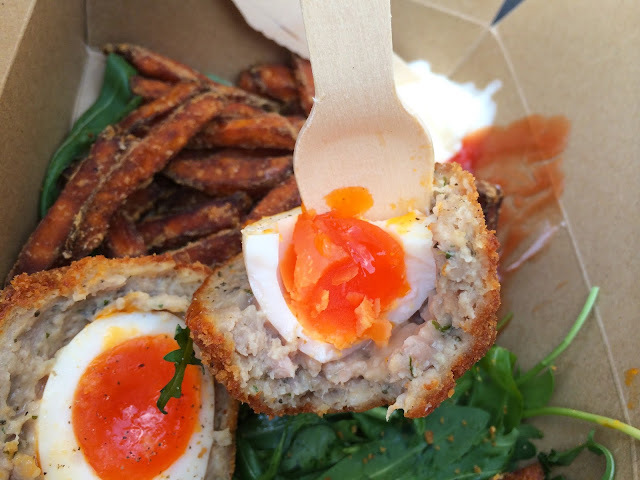 They are not the most amazing Scotch eggs I've had, but I like it as a lunch time option in Borough market. My scotch egg wow moment happened at Malmaison, as I wrote about here. This is funny because my co-workers tried to make Scottish eggs over the weekend and they failed miserably hahaha. It took them four hours! Totally showing them this entry. 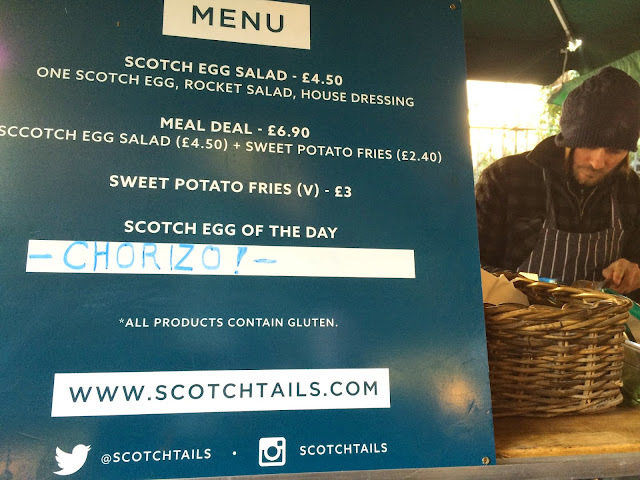 Sadly, I cut out beef and pork from my diet before I ever got to try Scottish eggs. Scotch eggs are not hard to make, but they are time consuming. You can make them with mince chicken instead, I made it like that a few weeks ago in a cookery class!